So many factors go into making a scene and there are so many variables that I decided to try the new water model, Physical Sea Water, in conjunction with the new Underwater Caustics. 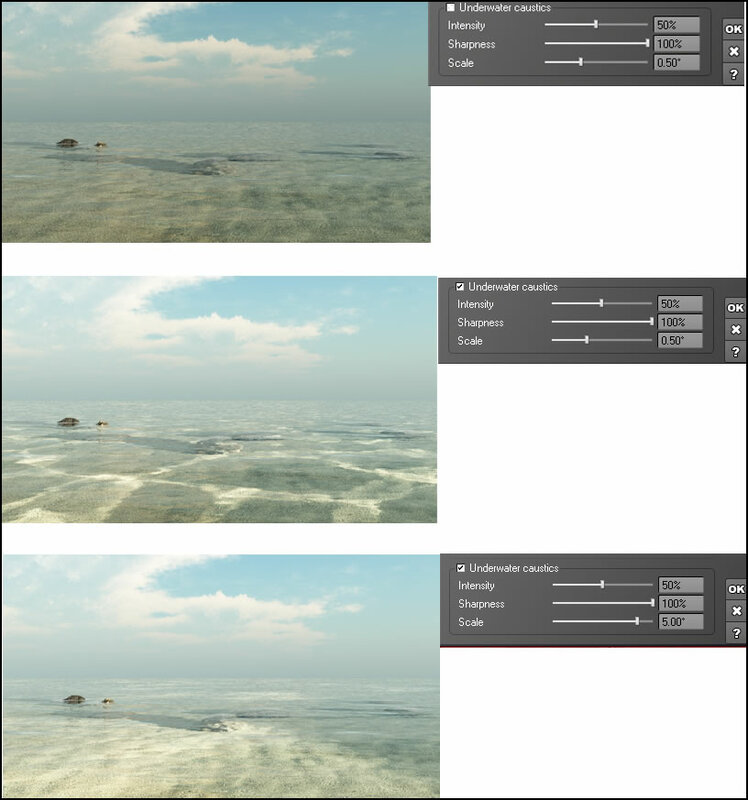 Obviously I could only give so many examples, but I hope these will help users decide on what variables to use such as lighting model, water surface controls, absorption and scattering values, etc. The latter two are found in the Advanced Material Editor. First, in both the default Metawater model and the Physical Sea Model the choices for controlling the body of water are the same. However the default settings in the Advanced Material Editor are not. The first test I did was of a scene with a body of water looking at the surface of the water, not below it. 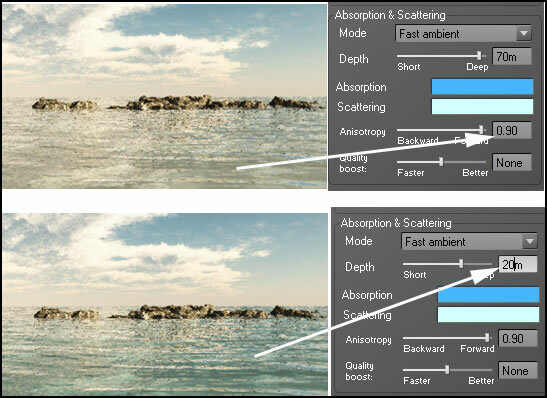 The two panels show the settings for the image. On the Physical Sea Water model, Physical water model under Effects is checked by default. 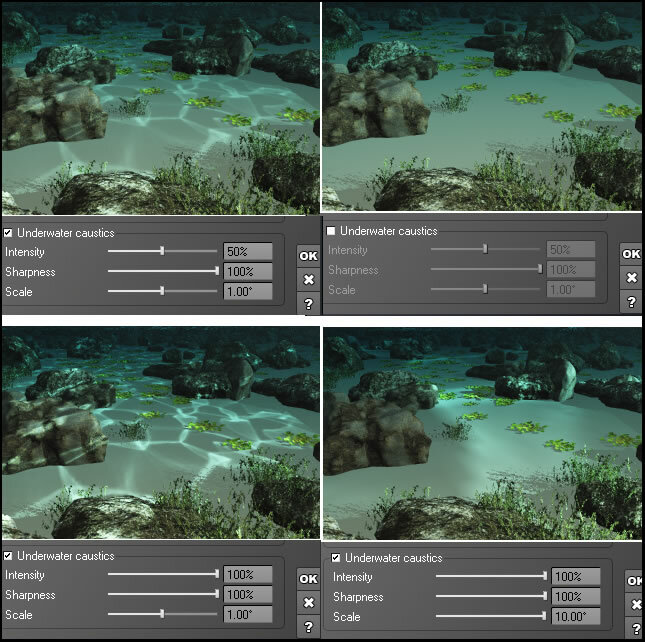 Below are three variations using the Underwater Caustic Controls. Notice how the Scale affects the amount of light on the water surface. 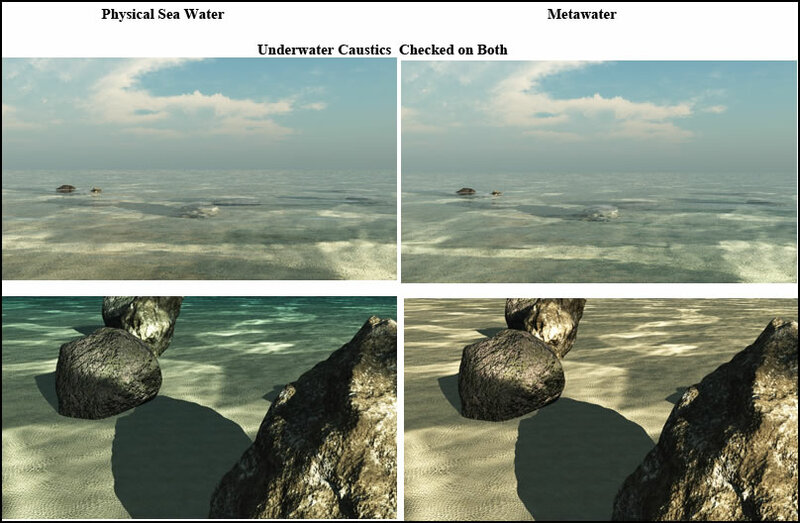 The top image below does not use underwater caustics. The color of the surface was controlled by the depth of absorption as indicated in the Advanced Material Editor. 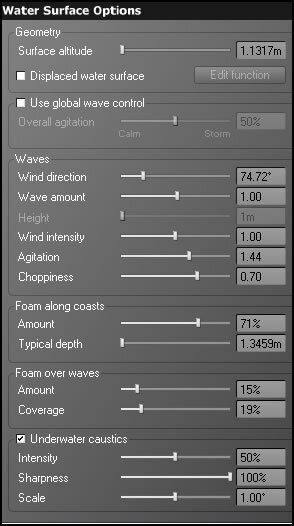 Below is another scene varying the settings of the Water Surface Control panel using the Physical Sea Water model. Next, I changed materials but kept the settings the same in the Water Surface Options. I wanted to see how the traditional default Metawater compared to the new Physical Sea Water model. I used a different image for the underwater scenes with more rocks partially underwater. The two sets of pictures represent those with the camera set for surface and for underwater. The settings in the Water Surface Control panel were the same. 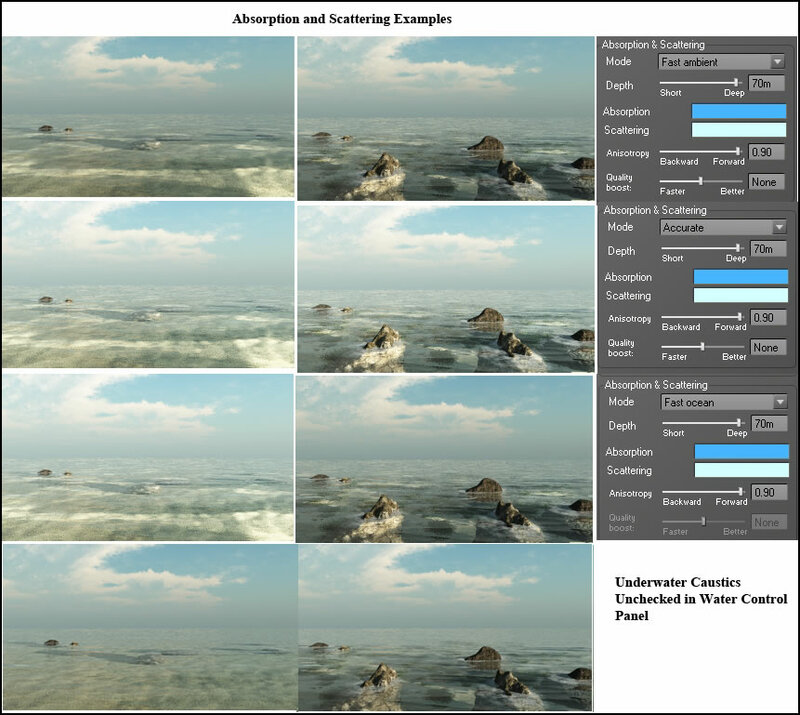 Below are examples of how the scenes are controlled by the Absorption and Scattering Controls. All but the bottom row have Underwater Cautiscs checked. The other settings are immediately following these examples. Notice how the objects in the scene interact with the lights on the water. The screen shot below shows the control settings. The last screen shows one scene using different lighting models. For the render mode, I have used User Settings with variations of the Final mode. This small, it is hard to notice differences in the rendered image even though in actuality there are. 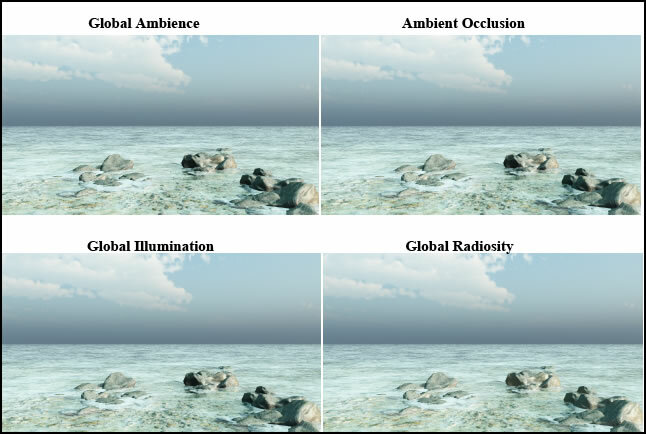 I have included this to show that in my examples the lighting has not made much a of a difference for the purpose of demonstrating how the Physical Sea Water model and Underwater Caustics work. 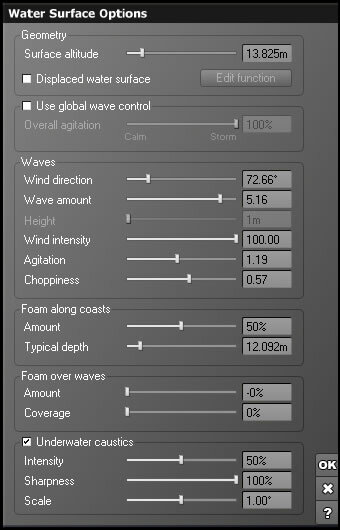 I have presented these examples to give an idea of the range of the new Underwater Caustic Controls as well as the new Physical Sea Water model. I think it is obvious that this new Physical Sea Water model adds a tremendous amount of realism. 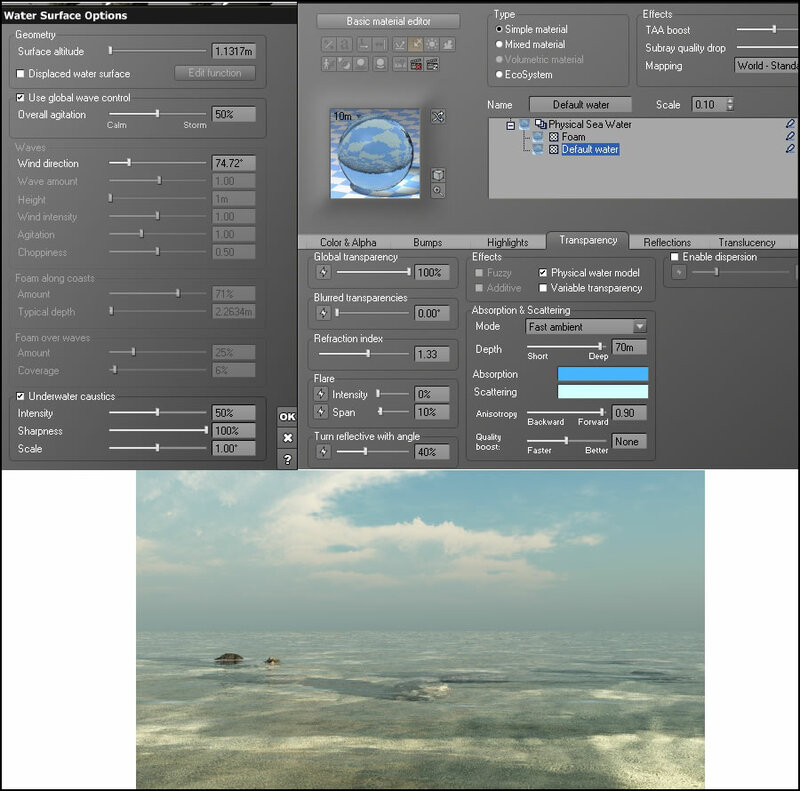 I suggest with each scene you create that you play with the different variables because the objects such as rock as well as the sky and clouds will tremendously affect the how the water surface looks or how the underwater area looks. A review of Vue 10 Infinite will be forthcoming.